That's right. We're having a giveaway here at the ShicShoppe blog. And there won't be just 1 winner, but 2 winners! See, we're still trying to get the word out about ShicShoppe and our best form of advertisement is YOU, the customer. So we're enlisting your help! The winners will receive any 1 item of their choice from ShicShoppe. 1 Entry (mandatory): Tell us what item from ShicShoppe you L.O.V.E. Giveaway closes Sunday, July 4th at midnight and the winner will be announced Monday, July 5th. Then stay tuned for another giveaway coming next week too. It's a giveaway extravaganza around here, I'd say! LOVE the Jayla! Too cute!!! I updated my status on facebook. I might be too lazy to put 3 entries for that, but I may come back later! I L.O.V.E the Wirework bracelet and the purple cuff. Such beautiful jewelry! I love the Jayla!!! So cute! I put a blog post about the giveaway on my blog. My Facebook has a shout out about your giveaway. My favorite is the "Kailey!!" I am so glad it comes in a 4T now!! 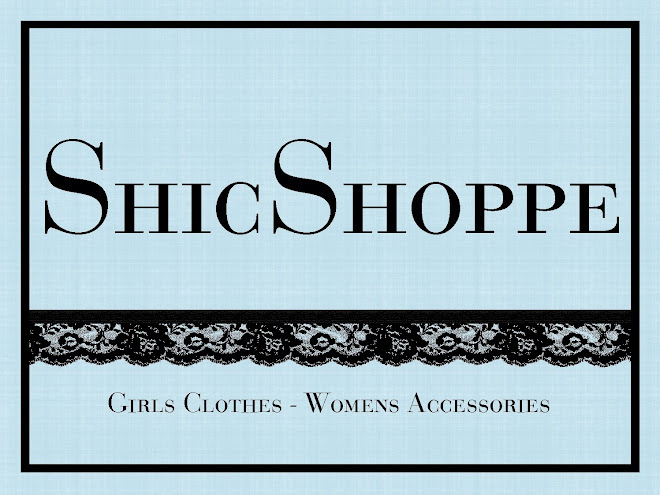 "Like" Shic Shoppe on Facebook. I LOVE the ELLE dress!! I love the teal Womens Bracelet! so pretty! I LOVE everything you do but if I had to pick one thing I would have to say it is the Annie skirt. Updated my status on FB! I like ShicShoppe on Facebook! I am loving the teal bracelet! So classy! I am a follower of your little blog! I like you a lot on fb!